US Marketers pull the pop-top on summertime ad campaigns. 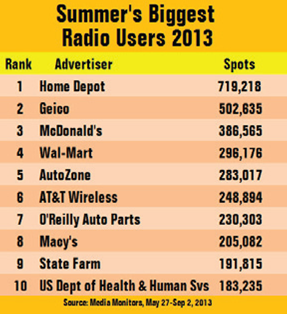 Thanks to its mobility, radio has long been the soundtrack to summer, attracting advertisers seeking on-the-go consumers. Despite all the new media options, for many marketers that remains just as true today as it has been in the past. Budweiser and Bud Light have traditionally been big summertime radio users and this year the flagship brand will wrap itself in the flag with a patriotic-themed campaign to help raise money for military families. Regional advertisers are taking a similar tactic. Blue Bell Creameries is using radio to help promote its Red, White and Blue Bell ice cream. And then there’s the Mexican fast food restaurant chain Qboda, which says it’ll be on radio this summer hyping its seasonal menu items like the Mango Mojo Burrito and the Mango Mojo Salad. CFO Jerry Rebel told investors this month that Qboda flies under the radar as it puts “a lot” of its marketing dollars into radio and outdoor — and there have been “some increases” in those budgets as the restaurant chain has launched new products. Something a bit healthier will be the focus of radio ads by Jamba Juice. Starting next week it will race to market an expanded line of fresh-squeezed juices to 500 stores — six months ahead of schedule. Jamba says to reach customers this summer it’ll rely on radio and social media. The National Association of Convenience Stores is forecasting sales to jump 8% to 10% this summer, returning to pre-recession levels as Americans cooped up all winter hit the highway. The trade group says consumers in the Midwest are most likely to spend more money this summer. And Americans are expected to average more than two summer vacation trips of at least two nights away from home, with the bulk of the travel occurring by car. With that as a backdrop, some travel-related advertisers are hitting the radio airwaves, like the upscale Coral Gables, FL resort The Biltmore. It is buying time on English- and Spanish-language stations in Florida as part of its first ad campaign in a decade. Also planning radio spending are state tourism offices in New York, Michigan, and northern Ohio’s Lake Erie Shores & Islands campaign, among others, with cities such as Milwaukee, New York City, and Roanoke, VA also launching their own radio ad blitzes.